This is what we’re going to be talking about when the mullahs nuke us. Almost. When the Allahu Akbar boys opened fire, Paris was talking about the climate-change conference due to start later this month, when the world’s leaders will fly in to “solve” a “problem” that doesn’t exist rather than to address the one that does. But don’t worry: we already have a hashtag (#PrayForParis) and doubtless there’ll be another candlelight vigil of weepy tilty-headed wankers. Because as long as we all advertise how sad and sorrowful we are, who needs to do anything? With his usual killer comedy timing, the “leader of the free world” told George Stephanopoulos on “Good Morning, America” this very morning that he’d “contained” ISIS and that they’re not “gaining strength”. A few hours later, a cell whose members claim to have been recruited by ISIS slaughtered over 150 people in the heart of Paris and succeeded in getting two suicide bombers and a third bomb to within a few yards of the French president. 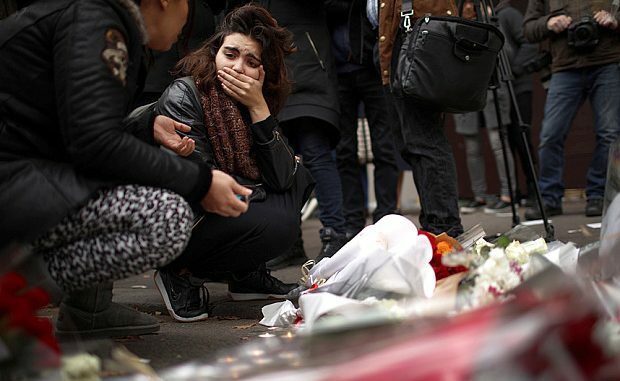 Visiting the Bataclan, M Hollande declared that “nous allons mener le combat, il sera impitoyable“: We are going to wage a war that will be pitiless. Does he mean it? Or is he just killing time until Obama and Cameron and Merkel and Justin Trudeau and Malcolm Turnbull fly in and they can all get back to talking about sea levels in the Maldives in the 22nd century? By which time France and Germany and Belgium and Austria and the Netherlands will have been long washed away. Among his other coy evasions, President Obama described tonight’s events as “an attack not just on Paris, it’s an attack not just on the people of France, but this is an attack on all of humanity and the universal values we share”.